Drie and I headed out to Lansing for Scott Kelby's Worldwide Photowalk, our first organized Photowalk. 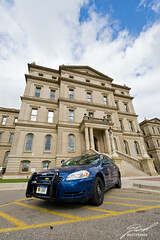 As we approached the rear entrance of the Capitol building the view was obscured by this State Properties Patrol Vehicle. I liked the contrast though and decided to play with it a little. I never got what I wanted, but this was fun.